The past never stays in the past, it rears its ugly head eventually. James the Black Douglas knows this all too well. With a past that has left him vengeful and his dragon blood thirsty, his reputation as a ruthless warrior haunts his enemies in their sleep. As his allegiance stands with Robert Bruce, the King of Scotland, he must now repay a debt to the king and agrees to marry his daughter, Abigale Bruce. The problem is he doesn’t want a wife. When flames start to burn out of control between him and the auburn-haired lass, he must decide to either kindle the flames of passion or shelter her from the truth and set her free. Determined to keep his daughter safe and out of the hands of the English, Robert hides Abigale behind the safe walls of a nunnery. After eight long years of living her life in seclusion, Abigale is finally set free. But her new found freedom comes to an abrupt halt when she learns of her betrothal to the infamous Bogeyman – James the Black Douglas. She soon finds herself falling in love with the uncontainable and haunted man. Is her love enough to soften his hardened heart? The white stallion inhaled deeply then snorted, as he ate from a patch of lush green grass. Long white hair with streaks of gray fell over his muscled neck as the fine steed shook his head and stomped his hoof. He pulled on a blade of grass, indicating that he was perfectly content grazing near the loch’s edge. A slight giggle escaped her mouth as she splashed at her horse. Abigale Bruce had ridden hard and fast through the glen most of the morn. Since her father’s recent successful victory over the English at the battle of Bannockburn, Abigale had been freed from the nunnery. Her excitement of finally being able to explore her new-found freedom was too much to hold back as she charged through the forest. Now she rewarded Fergus with a patch of grass while she cooled off in the loch. Oh how she cherished these moments; they were few and far between. Eight long years at Dunfermline Abbey wasn’t the ideal place to grow up, but she had no choice in the matter. Her father, Robert the Bruce, King of Scotland, had placed her there in order to keep her safe from his enemy, the English. Throughout her time at the Abbey, King Edward, the King of England, had gotten close to capturing her a few times, but the small secretive community of nuns had held true to their oath and kept her hidden well. Unhappy about the newly crowned King of Scotland, the English had captured Abigale’s step-mother, half-sister, and her two aunts, and had also beheaded three of her uncles. Humiliated, held prisoner behind iron bars of a bird cage, and hung from the Tower of London had been the women’s fate. Even though her freedom was taken away, Abigale knew it was nothing compared to what they had endured. Abigale’s trouble had started as soon as she walked through the gates of the abbey. Robert Bruce had given Dunfermline Abbey a generous contribution to repair part of the church that had been attacked by King Edward. In return he requested that Abbot Benard take his daughter in and protect her. With such a gracious amount of coin given, the Abbot could not refuse. Therefore Abigale, at the wee age of ten, had been left at the abbey and placed in the cruel hands of Abbess Margaret. Since Abbess Margaret was in charge of twelve nuns, she declared she had not the time to look after the wee brat, so she left Sister Kate in charge of Abigale. Abbess Margaret was a beautiful middle-aged woman with short, raven hair, and possessed the ability to inflict the cruelest of punishments. She watched and waited for Abigale to slip up so she could take pleasure in punishing her. Abigale knew why the woman hated her; she was jealous and thought it unfair that she had special treatment just because she was the king’s daughter. After a few missed visits from her father and daily tongue lashings from Abbess Margaret, Abigale started to feel pushed aside and abandoned, yet her spirit held firm. Sister Kate had kept a watchful eye on Abigale, keeping her work-load full so she would stay out of trouble, but trouble seemed to follow her wherever she went as if she was born into it. Abbey life wasn’t the life for her. She grew to hate the prayer bells, for they rang eight times during the day starting at the wee hours of night. The blasted bell would ring either when she was sound asleep or assisting a monk in surgery. More times than not she was late to prayer and being tardy was frowned upon. The consequences were harsh, in fact they were harsher than falling asleep during worship. Abigale knew this all too well; she had fallen asleep in a choir stall one night. Sister Kate had been the circator that night, pacing up and down the aisle as she shined her bright cresset lamp into the stalls checking if anyone had fallen asleep. A sharp point with a stick to her ribcage had woken Abigale up quickly. Of course she got a rap on the legs for that one. Thank God it was Sister Kate, for she showed her mercy. Now that she was home, her father was more than ever adamant about keeping his family safe. He vowed to never allow another Bruce woman to be captured by the filthy Sassenach. Just as Abigale thought she’d regained her freedom, here she was once again with it ripped away from her by an arranged marriage to her father’s first in command. Who better to protect her than the Bogeyman himself? Trepidation crept over her, sending a shiver through her body as she thought about the man her father had arranged for her betrothal. “The Black Douglas,” she thought. A man with a reputation that would make the Devil himself shudder with fear. A ruthless warrior who had fought in many battles with her father. The English feared him terribly, making up nursery rhymes warning their wee bairns to “hush before the Black Douglas will get ye”. She’d never met the man before, but the deal was done. Her father had arranged the marriage and Abigale was to abide by his orders. Abigale turned to Fergus who was chewing on a blade of grass. “At least ye don’t have to marry the Bogeyman.” She shuddered. Saying it out loud made it all too real. For a moment she wondered just what the Black Douglas would look like. Could her father be so cruel as to wed her to an evil, battle-worn old man? Nay, who could possibly be scared of an old man? Then again, a warrior’s reputation lived on even after death. Or mayhap he really was a monster of some sort, a mythical creature of the night that lurked under your bed waiting to nip at your heels. Abigale was letting her imagination get the best of her. Shaking those thoughts from her head she dipped down into the coolness of the loch, washing away every bit of worry. Today was her day and she was going to enjoy the peace that the loch gave her before it was taken away from her. Coming back up she lay her body out flat to float on top of the water’s surface. Her light linen shift clung to her petite body, long dark auburn hair spread out and floated with the ripples of the water. Closing her eyes, she opened her arms out wide allowing her fears to fall from her body and sink to the bottom of the loch. A snapping of twigs alerted Abigale that she wasn’t alone. Quickly she dipped her body down into the water to hide from what was lurking in the woods. Panic pricked up her spine as she searched the glen’s wooded edge for some kind of movement. Nothing… no movement at all. It must be a small animal frolicking through the thicket. Another snap. This time it sounded too close and too loud to be a small animal. Abigale turned and faced Fergus. Ears pointing in the direction of the snapping sound, Fergus let out a gut deep neigh. “Ye heard that too?” she whispered, trying not to draw attention to herself. Abigale slowly moved toward the water’s edge, not making a sound. The last thing she needed was to be attacked by a wild animal or worst yet… a rogue Highlander. Dripping wet and cold, Abigale stepped out of the water and headed straight for the huge boulder covered in green moss where her dress and her dirk lay. If instincts had taught her anything, it was to never let your guard down and never leave home without your dirk. A third snap sounded like it came from behind her and way too close. Taking a steady breath, she grabbed her dirk and spun around to meet her attacker face to face. Lunging the blade forward she pointed it at his throat, the tip inches away from piercing it. “Och lass, I will no hurt ye.” A massive six-foot-four man with vibrant amber eyes stood before her with his hands up in surrender. “I have no weapons on me… frisk me if ye dinnae believe me.” With a sly grin he turned around with his arms in the air inviting her eyes to gaze upon every inch of his muscular body. Abigale took him up on his offer, for she could not will her eyes off him if she tried. Following his every move, her body became alive. Her hands began to itch as she thought about running them down the corded muscles that lined his abdomen. Hulking arms shimmered in the sunrays as if they had been kissed by the sun and she wondered how his arms would feel wrapped around her body. As he turned around, long black hair hung over his big broad shoulders and stopped at his shoulder blades. His lower back tapered in to a firm backside which was covered in a black and gray plaid. Funny… she had a sudden urge to squeeze his buttocks. God could not have forged a more perfect man, she thought. Being ten-and-eight, innocent, and sheltered behind the walls of the nunnery, she hadn’t had much of a chance to explore the ways of men. In fact if she wasn’t praying, she was in the infirmary mending men severely wounded from battle, or ill. Sister Kate’s nagging voice reminded her that “Ye only have room for one man in yer heart and He would never steer ye wrong.” Only if Sister Kate could see this man standing before her now, even she would blush. “Ye should no be sneaking up on me like that.” Abigale lowered the dirk, but still kept her grip tight. “Aye, I can see that.” He rubbed his throat. She stood shivering from the cold or mayhap from the intensity of his gaze; she needed to retrieve her clothes before she caught her death. Then she remembered that she was wearing a thin shift. Surely he could see right through to her naked body? Quickly with her free hand she tried to cover her breasts and still have some dignity. “Would ye kindly turn around now so I can dress?” She motioned with the dirk for him to turn around. He turned, giving her privacy to dress. “That’s a fine horse ye have there,” he said over his shoulder. Of the few times her father had come to visit her at the abbey, and there were only a few, she remembered the day when he had brought Fergus to her as a gift. A gift perhaps but more like a peace offering for being absent for over a year. Abigale forgave her father, and the white charger quickly became more than a horse, he was a friend. “Ye may turn around now.” As Abigale glanced up, her heart skipped a beat as amber eyes pierced her, sending a rush of heat through her body. She licked her lips and struggled to swallow past a dry throat. How could this man, who she had never met before, make her hunger for something that she had not yet had? Feeling uneasy, she broke their stare and quickly searched for her shoes. “Are ye a Highlander?” What kind of a question was that? Of course he was a Highlander… that was a plaid he wore. Way to go, Abigale Bruce, he must think I’m a real dunderhead. Indeed the ways of Highlanders were much different from the English-influenced ways of lowland men like her father. Still both parties had fought for Scotland until the crown and riches were in their grasp. Some would say that greed was the root of all evil. Abigale thought differently. The crown was the root of all evil. Men fought for it, killed for it, and sold their souls for a taste of the crown and the power it held. The crown grew evil in men and she knew that all too well because it was her father’s own greed for the crown that left her abandoned at the abbey. The unsettled nature of Scotland had left Abigale hardened. She’d seen firsthand the aftermath of battles fought; mended wounds, prayed over dead bodies, and even buried the dead. The nunnery where she grew up would set up tents to aid those wounded in battle. Abigale would assist in surgery and her passion grew for healing the sick and mending wounds. Life was to be valued, not destroyed. In a way she blamed Lady Scotland for her misfortunes. Her father’s growing need to fight for Scotland had caused her to stay hidden, conceal her true identity, and grow up without a family. Her whole family had been affected by the battles fought for Scotland and the greed of claiming the crown. Though it was true she had long forgiven the Lady; she could not forget. The Highlander seemed far away in thought, because he took a while to answer. “Some would say I’m a Highlander.” He approached Abigale. “May I?” The beautiful stranger reached for a piece of hair that was stuck to her face and tucked it behind her ear. He brushed a callused finger down her cheek to her slender neck leaving a fiery path trailing behind. He held her stare and captivated her to the point that she could not form a coherent thought. Her body was no longer hers to control, her heart dropped, and desire pooled in her core setting her body on fire. This Highlander was so close to her she could feel his breath on her skin, she could smell his masculine scent and soon she wanted to taste his lips. The mysterious man lowered his head, cupped his hand behind her neck, and pulled her close to him to claim her lips. Abigale drew in a deep breath in anticipation when suddenly a nudge from behind broke her trance. She turned to find Fergus. Another nudge by a wet gray muzzle almost sent Abigale to the ground until strong arms caught her around the waist. “I got ye lass,” he whispered in her ear. For some odd reason the deep rich tone of his voice soothed her. She closed her eyes, took a deep breath and leaned back against the warmth of his body. Wait… what was she doing? Abigale Bruce, you are to be married. Quickly she slipped away from his hold and began to gather up the leather reins. “I should be getting back.” Observing the stallion’s actions, it was clear to Abigale that Fergus did not approve of the stranger. Jumping up on the back of Fergus, she turned to face the Highlander. The man rubbed the back of his neck as if he was thanking the white horse for saving his arse from making a huge mistake. She dared one last look at him before she rode off into the glen back to her father’s castle where she would prepare for travel to Castle Douglas and marry the Bogeyman. Her eyes roamed his massive body sketching everything about him to memory; his striking amber eyes, strong masculine jaw line, and the way his eyes strayed over her body. She did not want to forget this man. If only she did not have to go. Mayhap she could run away with this beautiful man and avoid being married to a monster. 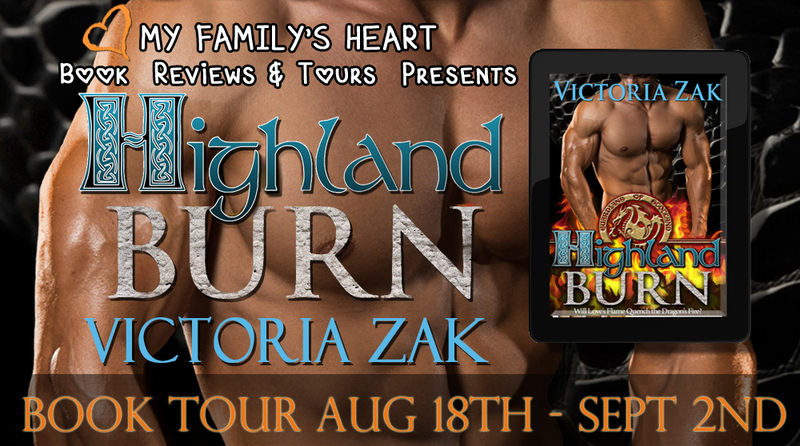 Deep down, she was drawn to this mysteriously intriguing, charming and pure male Highlander. He made her think that for once she could be in control of her life and make her own decisions. In a way she envied his freedom. It did not seem fair that she had to marry a man who her father wanted her to marry. Shouldnae one marry for love? But then again, he was a stranger… a mystery. Before she ran away with fantasies she knew better than to think of, she squeezed her legs, sending Fergus into a run. She had to marry the Bogeyman. This is by far one of the best novels I have read this year and the fact that this is the authors debut novel I have to congratulate her on an exceptionally job. She took an historical romance and interlinked it with an paranormal. This story had originality and will keep you wanting to stay attached to your e reader until the end. I read it in one sitting and stayed up late because I didn’t want to put it down. The cover is an amazing eye catcher and fit with what is in between these pages. The plot as I said is full of life and shows that the author put a lot of thought and passion behind what she wanted her readers to see. It is a story about a form of ancient life called Dragonkine ( human/dragon shifter type) and an abandoned princess who was sent to a nunnery for protection against those that wanted to find a way against her father the king of Scotland. Sounds enticing right, trust me there is a lot that captures your attention and will also keep you on the edge of your seat because theee are twist. I had a couple of times trying to figure out who the Villan was, lol. Lets talk ababout the characters. Abbie, has lived a sheltered life due to being placed in a nunnery. For the most part it was not pleasant, but she overcame until she was picked up to be told of an arranged marriage. Can you see she has abandoned and trust issue. Her characters started off shy but she does learn to trust herself and finds her feisty self. James, has a big secret that he doesn’t want his soon to be wife to see. I liked him because on the outside he had this hard form but you could see it slowly break down for Abbie. Including keeping her out of his secret. Will these two survive what is to happen and can she live with what she finds out about him? That is one story you have to read. I definitely can not wait for another one by this author she has left it open for a series so I am hoping we are not kept to long. I am looking forward to continue reading her work. I highly recommend this novel!!! Victoria Zak lives in the sunshine state with her husband, two beautiful children, and three furry friends. Before having kids, Victoria spent fifteen years in the veterinary business and volunteered in pet rescue. 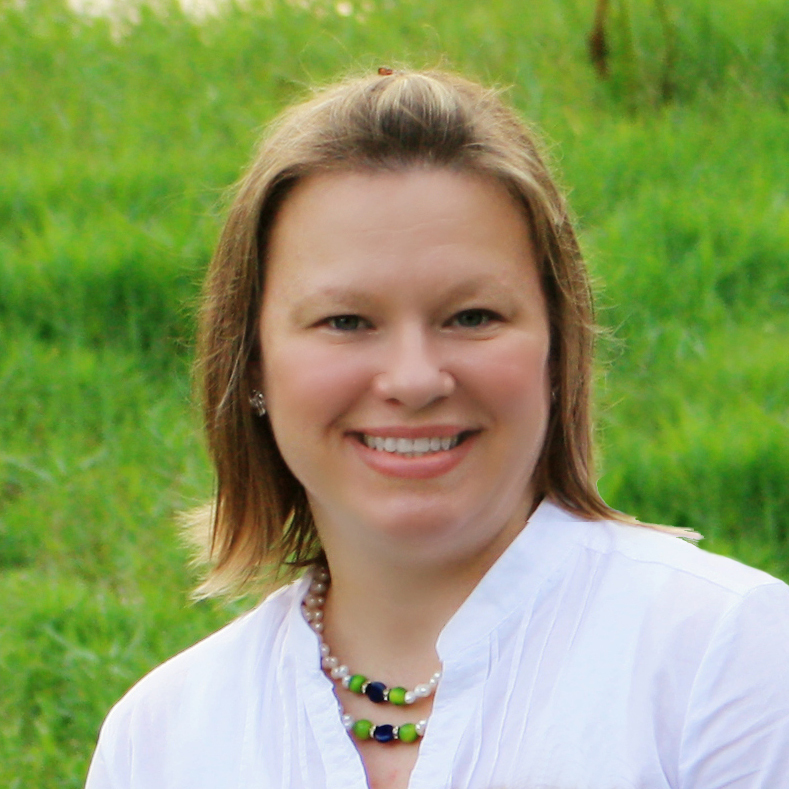 A writing career was the last item listed on her bucket list, until she discovered that she wanted to put her stories on paper and breathe life into her characters. 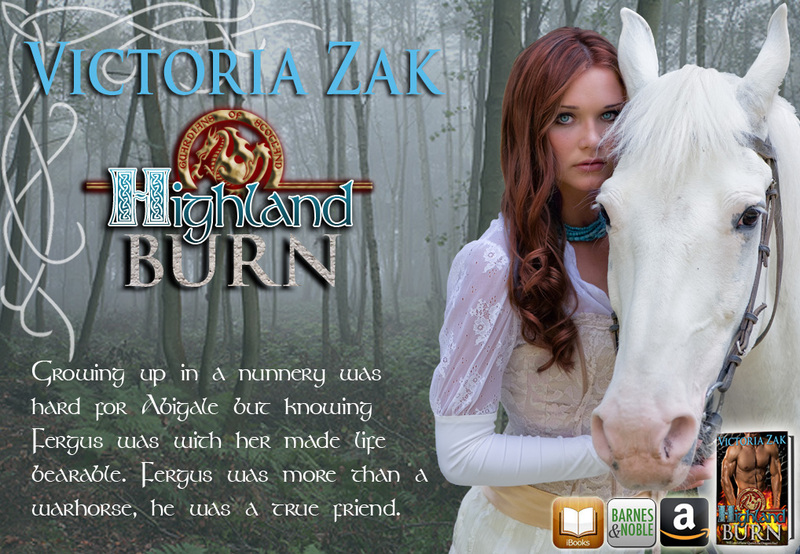 Her love for Scotland, curiosity of history, and passion for romance has inspired her to write her first book, Highland Burn.